The full moon approaches, as does Halloween, which may make you want to howl at the sky, but don't do that. Instead, express some autumnal enthusiasm through the moon cake. This Chinese treat is traditional at the time of the Harvest Moon, which actually was last month, which makes me 30 days late. But it so happens that the full moon tomorrow will be the biggest full moon of the year, making this quite a fortuitous -- as well as tasty -- recipe. Violet Arakaki e-mailed in search of a recipe, and it turns out it's not that hard, once you find all the right stuff: a moon cake mold and some pre-made bean paste. Both of these, and the salted duck eggs that often are tucked into the cakes, can be found at Bo Wah Trading Co. on Maunakea Street, between Hotel and King. To make crust: Melt butter, then let cool to room temperature. Combine flour, powdered milk, salt and baking powder. Beat eggs and sugar vigorously 5 minutes. Beat in butter and vanilla, then gradually fold in dry ingredients to form a rough dough. Turn onto a lightly floured surface and knead until a smooth dough forms. Roll into 2 logs and cut into 20 pieces (10 pieces per log). Preheat oven to 375 degrees. Lightly grease 2 baking sheets. 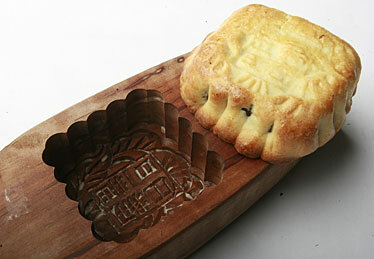 Dust moon cake mold with flour. Use fingers to press each piece of dough into a thin, 4-inch circle. Press the edges even thinner. Wrap a yolk inside a 2-tablespoon scoop of bean paste and place in center of dough circle. Gather up edges of dough to enclose filling and pinch to seal. Roll cake into a ball. Press ball into mold. Tap mold on sides to release cake. Arrange cakes 1 inch apart on baking sheets. Brush cakes generously with glaze on tops and sides. Bake 20 to 30 minutes, until golden brown. Makes 20 cakes. This is part 2 of our adventure in moon cakes. Turns out there's plenty to say about this traditional Chinese treat, beginning with an alternative to laying out $15 for a special mold. A mold is crucial to the traditional look of the moon cake, creating the scalloped border and the pressed-in design on top. But if you can't find a mold or don't want to spend the cash, simply form your cakes by hand into rounds, making sure that the dough closes up neatly around the filling. Score a crosshatch design lightly on top using a butter knife. Your cakes won't be recognizable as moon cakes, but they'll taste fine. The bean filling in the basic recipe above fused a pre-made sweetened bean paste available in Chinatown. It's a mixture of mashed red beans (also called azuki beans) and sugar. You can make it from scratch, but it's tedious: Soak a pound of dry beans in water for two hours, then simmer for another two hours in 8 cups of water. Mash the beans and strain out the skins (for a really smooth result, strain again through cheesecloth). Mix in 1-1/2 cups sugar, or to taste. Some recipes also call for mixing in lard or shortening, about 3/4 cup. Another option if you don't want to do all that work, but can't find the Chinese paste, is to try Japanese bean paste, called an, which is sold in cans in most supermarkets. Now, the bean-filled moon cake may be the most familiar, but many types of fillings are traditional, among them a lotus-seed paste, various fruit combinations and even meats. Nina Simonds, author of several books on Asian cuisines, is the source of the recipe that follows, which is posted on her Web site, www.spicesoflife. com. At this site you'll find a video showing the moon cakes being made, in case you're having trouble visualizing the recipe instructions. Simonds' site offers recipes, stories and videos on a range of Asian foods, plus shopping tips and other advice. To make crust: Melt butter, then let cool to room temperature. Combine flour, powdered milk, salt and baking powder. Beat eggs and sugar vigorously 5 minutes. Beat in butter and vanilla, then gradually fold in dry ingredients to form a rough dough. Turn onto a lightly floured surface and knead until a smooth dough forms. Roll into 2 long logs and cut into 20 pieces (10 pieces per log). If dough seems soft, it may be chilled 15 minutes to firm it up. Combine filling ingredients; divide into 20 portions. Use fingers to press each piece of dough into a thin, 4-inch circle. Press edges even thinner. Place a portion of filling in center of dough. Gather edges of dough to enclose filling and pinch to seal. Roll the cake into a ball. Press firmly into mold. Tap mold on sides to release cake. (If not using a mold, press cake into a 3-inch round; score top lightly in a crosshatch pattern). Arrange cakes 1 inch apart on baking sheets.